Your spine is at the center of a delicately balanced system that controls all of your body’s movements. Bones, muscles, ligaments, tendons, and nerves all work together to balance the weight of your body. Even minor damage to one component of your back’s structure can upset this fragile balance and make movement painful. It is not surprising, then, that back pain is second only to headache as the most common cause of pain, or that 8 out of 10 people will have a problem with back pain at some time. The causes of back pain can be simple or complex; the vast majority can be treated non-surgically, but in some serious cases, surgery is necessary. 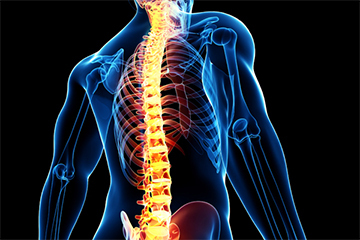 Spine & Orthopedic Center is rapidly gaining a reputation as a world leader in spine treatment. Patients come from all over the world seeking spinal treatment by our award-winning orthopedic doctors and surgeons. Please find below some of the most common spinal conditions, treatments and procedures performed by our specialists. Disc herniation, often referred to as a “slipped” or “ruptured” disc, is a common cause of low back, neck, and even arm or leg pain. The most frequently affected area of the spinal column is the lower back (the lumbar section of the spine), but any disc in the vertebral column can rupture. Vertebral discs are the shock-absorbing, protective discs found between the bones of the spinal column (vertebrae). These discs are made up of a strong outer shell of cartilage encasing an inner gel-like substance. Although they do not actually “slip,” they may rupture or split, allowing the inner gel-like material to escape into the surrounding tissues. This puts pressure on nearby spinal nerves, which are very sensitive to even the slightest of pressure. Nerve irritation then results in pain, numbness, or weakness in the back and can radiate to one or both legs or arms. Narrowing of an area in the spinal canal which may cause “nerve symptoms” if the narrowing compresses a nerve. Your spine is a strong and flexible bony structure, made up of five sections from the neck to the tailbone, consisting of 33 bones or vertebrae. 1. Cervical spine (neck) 2. Thoracic spine (upper back) 3. Lumbar spine (lower back) 4. Sacrum 5. Coccyx (tailbone) In the cervical, thoracic, and lumbar areas, cushion-like discs separate the vertebrae, giving the spine the ability to bend and turn. There are five vertebrae in the sacrum, but they are fused naturally and do not have discs to separate them. The coccyx has four smaller vertebrae that also are fused. The cervical spine (neck) consists of seven vertebrae numbered C1 through C7 from top to bottom. Each of the top two vertebrae has a unique design. C1 is a two-tiered ring that is attached to the skull. C2 has a protrusion that acts as a post around which C1 rotates. C1 and C2 are primarily responsible for the motion of the head. Each of the remaining vertebrae in the cervical, thoracic, and lumbar regions has a pair of facet joints that connect to muscles and ligaments to keep the vertebra in place, as well as a disc, which cushions the spine and allows it to move. The thoracic spine (upper back) consists of 12 vertebrae that are attached to the ribcage. Very little motion occurs in this region and problems in this area are relatively uncommon. The lumbar spine has five vertebrae. This region endures a lot of stress, especially when you bend, and is a common source of back pain. The spinal cord runs from the brain through the cervical and thoracic spine, where the nerve roots come off the cord to form the cauda equina, or “horse’s tail.” At each level of vertebra, a nerve root exits on each side of the spine to the right and the left. In the cervical spine, the nerve root is labeled according to the lower segment that it runs between; in the lumbar spine, the nerve root is named after the upper segment that it runs between. That means that the C5 nerve root runs between C5 and C4, and the L4 nerve root runs between L4 and L5.